While the past century has seen the large scale clearance of Rainforest ecosystems by intensive agriculture and timber extraction interests. If current trends continue we will see the decimation of most rainforest systems within our lifetimes. A loss of the worlds most diverse ecosystems which is also the largest carbon sink of the world would have dramatic effect on life as we know it. The Rainforest Project has been working with global partners in three world heritage listed rainforests to reverse this trend. We are planting 2 million endemic and native rainforest trees in 2018 to bring a stop to this trend. The Rainforest Project works with it's partner Rainforest Rescue International to rebuild connectivity amongst the last remaining 5% of rainforest in the country. Much of Sri Lanka's rainforest has been lost to Tea and Rubber production in the past 100 years, disturbingly this trend is continuing. The remnant biodiversity of this Hot spot continues to cling on to the dwindling habitat in the face of urbanisation and agricultural expansion. Leaving the distribution of the remaining ecosystems to become increasingly fragmented. We are working together with over 2500 farmers to create improved buffer zones and connectivity through the development of corridors and enhancement of habitat. In 2017 we supported the planting over 50,000 rainforest trees to be introduced onto lands earmarked as a biodiversity corridor. The Singharaja Man and biosphere Reserve, Sri Lanka 2018 with extensive Tea production in the foreground. As the remaining rainforests in Sri Lanka are reduced to a mere 188 small patches. Restoration forestry is a must to protect the existing forests and their vulnarable ecosystems, which are continuing to be reduced due to the expansion of Tea and agricultural lands, extraction of valuable timber species and encroachment. This ecosystem is the last habitat for species such as endangered and threatened Purple Faced Leaf Eating Monkey, the nocturnal Slender Loris, Sri Lankan Leopard and Elephant. The Rainforest Project supports their partner Rainforest Rescue International in restoring biodiversity habitat in degraded and logged land areas along propertied earmarked as the Singharaja biodiversity corridor. The Leuser ecosystem was once part of the greater Indonesian rainforest which stretched for 150 million Ha. These special forests are relict ecosystems, which share features with ancient Gondwanan flora. It is also the only forest in the world which harbours the big four species, all critically endangered Elephant, Rhinocerous, Orangutan and Tiger. The Leuser ecosystem is a magnificent and beautiful 1.6 Million Ha forest which is presently being impacted by oil palm interests. The three largest oil palm producers are active in the area and conflict palm oil is a growing problem.Illegal Palm oil is on the rise as poor communities have little option for income generation except to feed the supply chain of local Palm oil barons. We work to Stop illegal Palm Oil and support our Indonesian partner, Orangutan Information Centre remove illegal Palm oil and provide local communities opportunities that restore local habitat. 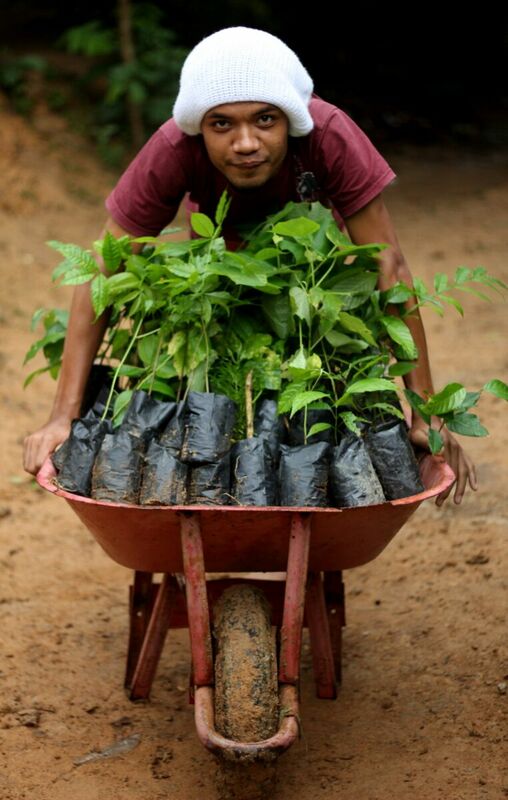 We work with our partner the Orangutan Information Centre to reforest areas impacted by illegal palm oil through community based planting programs. Help us continue to restore the Leuser Ecosystem. The Daintree Rainforest Ecosystem is the largest tropical rainforest in Australia. This ecosystem stretches from the coast and covers 1200 sq klm. The Daintree Rainforest contains 30% of the frog, reptile and marsupial species in Australia, and 90% of Australia's bat and butterfly species. 7% of bird species in the country can be found in this area. There are also over 12,000 species of insects in the rainforest. All of this diversity is contained within an area that takes up 0.1% of the landmass of Australia. In 1982 with government support 1100 blocks of the Daintree was purchased for private development. During this period private land holders began developing their land holdings and removed forest lands. Successive governments rolled back the development plans and engaged in buy back of all private lands, about another 100 of these private land holdings remain. However forest restoration is required to build these areas back. A keystone species for the Daintree ecosystem is the threatened southern cassowary australia's largest native bird, which plays an important role as a large seed disperser. Cassowary habitat and food plants are on the decline in areas that are earmarked for development. The Rainforest Project and local partners are engaged in building back the Daintree by building back essential cassowary habitat. The Rainforest project is supporting local conservation and land care groups such as Rainforest Reserves Australia to grow rare rainforest trees. Help us plant back the Daintree and Atherton tablelands one tree at a time!